Matthew Carlson, MD, brings world-class experience to the AHRF Research Committee as an Associate Professor of Otolaryngology-Head and Neck Surgery and Neurosurgery at the Mayo Clinic in Rochester, Minnesota. 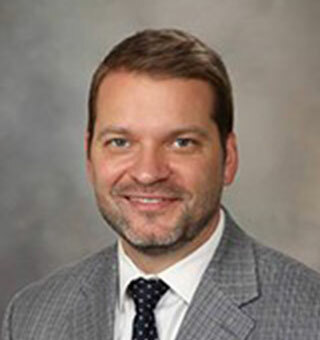 He is the Program Director for the Mayo Clinic Neurotology Fellowship, the Associate Program Director of the Residency Program, in addition to the Medical Director of the Cochlear Implant Program and the Temporal Bone Dissection Lab at Mayo Clinic. Carlson received his residency training in Otolaryngology-Head and Neck Surgery at the Mayo Clinic and completed a two-year Neurotology Fellowship at Vanderbilt University in Nashville, Tennessee. He is active in clinical and basic science research in the areas of vestibular schwannoma (also known as acoustic neuroma) and cochlear implantation, with a particular interest in quality of life outcomes in vestibular schwannoma. Carlson has received several awards and honors, including the 2018 Mayo Fellows Association Otolaryngology/Audiology Teacher of the Year Award. He is Co-Director of the upcoming 8th Quadrennial International Conference on Vestibular Schwannoma and other CPA (cerebellopontine angle) Tumors.